THE GURGLING COD: I can't believe it's not Polish Sausage! I can't believe it's not Polish Sausage! In Chicago, where the Cod will be to the many nice places to eat as Stephen Maturin is to the Galapagos &c. in the Patrick O'Brian books. That is to say, a job that puts me within tantalizing proximity of interesting things, but prevents me from enjoying them. As a silver lining, I do commend the annual convention of the Modern Language Association to anyone who wants evidence supporting Woody Allen's thesis that real life becomes more and more like high school. "Of the four flats creen monitors at Todd English's Bonfire, only two -- barely 50%! 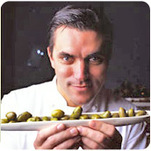 -- are dedicated to Todd English content." That's right -- the man has videos of himself playing on video monitors at his eponymous airport outpost. 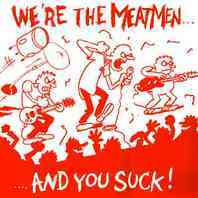 Meatmen fans will recognize an affinity with Slammy from Miami. No word yet on when Eric Ripert's Jumbotron will be operational at Le Bernardin.